@Logistician - Many of you out there think you may already be one of these; so let's cut to the chase. A Logistician in our context is about looking for Freight Movement Options. With recent industrial developments, is this not what is on all our minds when we are talking distribution or transportations and logistics? The Industrial Logistics Institute has been in operation since 2007, and our focus has been on consulting and training in Transportations and Logistics. With the increased use of ICT in recent years and the surge internet purchasing, suddenly starts to change the way we approach the Logistics and Supply Chain functionality. Having been involved with a number of online start-ups we know things move on with time as technology and development increase. What we have found is that the Transportation industry in Australia tends to lag behind when it comes to using the technology that is available today. So we decided to provide, in a non-threatening way, information on the recent developments in the freight and logistics space across the globe. In reality, these movement options are available to us all, we just haven't stopped to take a look around us. Whether we like it or not, today and into the future the industry will be under great threat if it continues to lag as our international partners and indeed our customers will demand that the communication occur this way. Customers as we know are the life blood of our business. Transportations and Logistics and the right infrastructure has been a topic foremost on a number of both political and professional minds for some time. The growth of and use of Internet technologies for purchasing goods and services has increased the amount of parcel deliveries to B2C and B2B market. Once companies put their products online they realise they are now advertising these to the world and as a result in need to have some sort of Global Logistics arrangement in place in order to deliver goods purchased. We only need to look at the recent increase in parcel deliveries experienced by our Postal networks and the changes they have had to make to accomodate this growth. 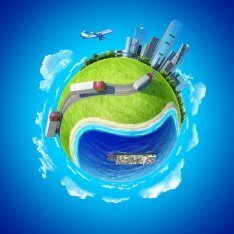 Logistics as we know it comes in many shapes and forms and it includes not just one but many areas of the Supply Chain. Specifically, @Logistician focuses on Transportation Logistics and it’s ‘touch-points ‘ in other areas across the supply chain unlike other areas of Industrial Logistics Institute that has a focus on training and development. However, as you are all aware, that is only one aspect of the Supply Chain. With the introduction of low cost labour options (that became more of a trend with the “outsourcing” concept over the last decade), no one ever factored in the additional costs of logistics. Yes, we all saw the savings with lower cost of employment but once we sat down and added up the cost of consultants, retrenchment, increased distribution and transit costs not to mention the lost time in transition - did we really save anything? And then we had the quality control issue and the cultural issues to deal with as well as we tried to blend our offshore partners and their culture with those on the homeland. At this point a number of organisations had invested too much time and money to abandon the project and as a result had to see things through as there was no point of return. Hard realities for some organisations perhaps, but that’s not to say that there have not been the success stories as well. Technology and it manufacture is well suited to the lower labour cost option and in a lot of cases where the country of origin is the lower labour option this has worked exceptionally well. The logistics of getting the product to market is well refined and with the right infrastructure in place, we see the organisation thrive. The two Directors of Industrial Logistics Institute have a combined background that spans in excess of 40 years in the transport and distribution industry that has been involved in and managed at both the operational level and senior management level many times over the 40years. I promise to use it only to send you @Logistician's Journal.